Heat oven to 375° F. Spray 11x7-inch (2-quart) glass baking dish with cooking spray. In 2-quart saucepan, heat oil over medium-high heat. Cook red onion in oil 5 minutes, stirring occasionally, until tender. Stir in pork and barbecue sauce; heat until hot. Spread mixture in baking dish. Unroll dough into 2 long rectangles; firmly press perforations to seal. Sprinkle dough with paprika, cheese and 1/4 cup green onions. Starting at long side, roll up; cut into 12 slices. Place slices, cut sides down, on hot pork mixture. In small bowl, beat egg and water; brush evenly over dough. 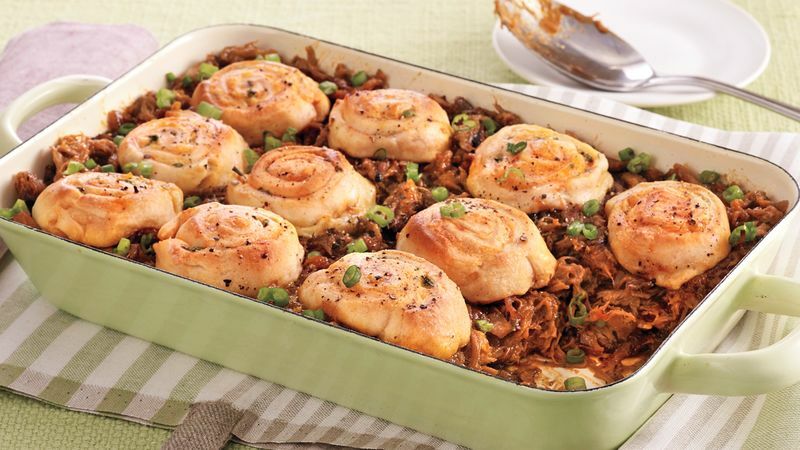 Bake 28 to 30 minutes or until filling is bubbly and rolls are golden brown. Sprinkle with additional green onions.